A biopic based on the life of a former TWA pilot, named Barry Seal, who became a contract pilot working for the CIA, as well as a drug smuggler for the Medellin Cartel (in the 1980s), and later served as a DEA informant. 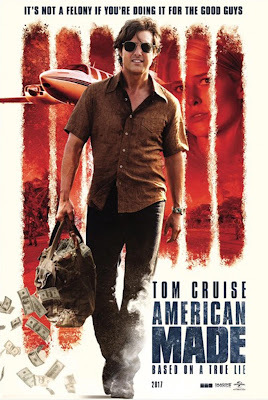 The movie stars Tom Cruise as Barry Seal, and it costars Domhnall Gleeson and Sarah Wright. It was directed by Doug Liman (who also directed Cruise in 2014's 'EDGE OF TOMORROW'), and it was written by Gary Spinelli. The film is a modest hit at the Box Office so far, and it's also garnered mostly positive reviews from critics. I found it to be a highly entertaining, and pretty educational crime biopic. In the late 1970s, Barry Seal (Cruise) was a bored pilot working for TWA, and also smuggling illegal cigars into America. He's approached by a CIA operative, going by the name Monty Schaefer (Gleeson), and offered a job flying clandestine reconnaissance missions over South America. Seal is later asked to be a courier between the CIA and General Noriega, and during this time he's also asked to fly cocaine into the US (on return flights), by the Medellin Cartel. The CIA pretends not to be aware of this, and continues to employ Barry; while moving him and his family to Mena for safety. Seal continues working for the cartel, and the CIA (making tons of money), while also trying to keep his wife (Wright) and daughter happy. The movie is surprisingly entertaining, from the opening scene till the very last (and that's a pretty high compliment in my opinion). It's just a hell of a lot of fun! Cruise is amazing (like usual) in the lead, and he pretty much makes the whole movie work (on his own almost). Liman is a decent enough director too, but this movie is all about Tom Cruise (and he totally sells it). It's also amazing how he can make a character that should be pretty unlikable, in any other film, totally lovable (despite all of the immoral things he does). The movie is just a blast to watch, and that's saying a lot for a biopic (in my opinion). I usually think they're boring.